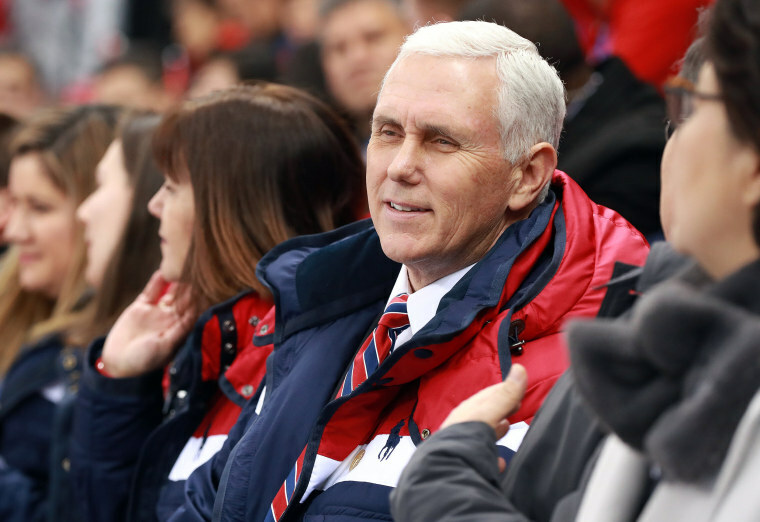 A pre-planned meeting between Vice President Mike Pence and North Korean delegates during the PyeongChang Olympic Games got derailed after North Korea backed out of the “secret” meeting hours before it was set to take place, the vice president's office told NBC News on Tuesday night. The Washington Post first reported that Pence had fully intended to sit down with the North Koreans at the Olympics, including Kim Yo Jong, the younger sister of North Korean leader Kim Jong Un, and Kim Yong Nam, the regime’s nominal head of state. Apparently displeased with Pence strengthening relations with South Korea and Japan in the time leading up to the meeting, as well as his continued condemnation of their nuclear program and human rights violations, the North Koreans pulled out, according to Pence's office. “North Korea dangled a meeting in hopes of the vice president softening his message, which would have ceded the world stage for their propaganda during the Olympics. Instead, the Vice President met with defectors who escaped tyranny, hosted Fred Warmbier whose son was essentially murdered by North Korea, pointed out their atrocious record on human rights and enslavement of hundreds of thousands of their people, spoke about their hostile plans with nuclear weapons and ballistic missiles, and announced a new round of tough economic sanctions were on the way,” Pence's chief of staff, Nick Ayers, said in a statement to NBC News. The meeting was planned two weeks in advance of Pence’s Asia tour and known only to a small group of White House insiders including national security adviser H.R. McMaster, White House Chief of Staff John F. Kelly and Secretary of State Rex Tillerson, the Post reported. The White House maintained that the meeting was not intended to lessen any heat on North Korea with regards to the stance the President has publicly taken against the country, according to the Post. The prospect for a sit down seemed bright as North Korean leader Kim Jong Un sent his sister as a delegate to the Olympic Games, signaling an openness for diplomacy not only with South Korea but with other nations. U.S and North Korean relations were at an all-time low over the past year with leaders of both countries taking personal jabs at one another. Trump calling Kim "little rocket man" and Kim calling Trump an "old lunatic" and a "dotard" in return.